Ready To Use Waterproof Coating that we offer is a silicone based excellent coating manufactured under the guidance of experts. 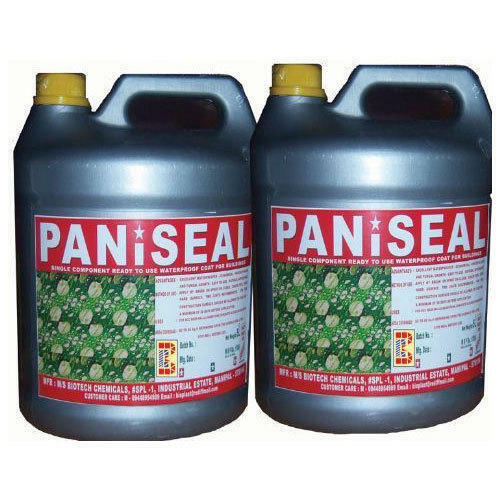 Our Paniseal Coatings are single component water base ready-to-use colorless waterproof coating for RCC roof, walls, sandstone, concrete blocks, tile surface, etc. which is a cost-effective way to protect the original beauty and integrity of the building. Clients can get Paniseal Coatings form us at competitive prices. The surface to be treated must be thoroughly cleaned. All dust, oil, loose material and foreign particles should be removed. Fill all surface cracks. Apply the ready to use Paniseal Coatings by brush or spray on prepared dry surface. The brushing has to be done minimum of 2 coats. For new construction surface should be allowed to cure for a minimum of 28 days before application. In case of surface is requiring painting after painting application has be done. Single Component Ready To use Waterproof Coat for Buildings. Established in the year 2007, Biotech Chemicals has gained a strong foothold as a prominent Manufacturer of Construction Chemicals in Manipal, Karnataka. Our wide range of Construction Chemicals comprises of Cement Waterproof Admixture, Tile Adhesive, Tile Joint Grout, Waterproof Coatings, Crack Fillers, Repair Mortar, Wall Putty and Cement Plasticiser. Mr. Shreedhara and Mr. Naveen, the General Managers of the company, both have an experience of 12 years in the market has taken the company to sky scrapping heights of success and we have attained immense trust and respect of the customers through ethical business approach propagated by them.